HP Deskjet 2540 is an attractive and small all-in-one printer. The printer focuses on making your printing experience completely smooth and PC-less. It offers high-quality outputs at a decent speed. This low-cost stylish printer is capable of printing, scanning, and copying. The wireless printer supports iPrint and AirPrint apps that let you directly print any document from your phone, tablet or any other wireless device. It is an ideal home printer that can successfully serve everyday printing purposes. The printer has a flatbed scanner and a deep hollow bottom as a paper tray that folds down when in use. It also has a basic LCD screen on the top along with a neatly lined up control panel. 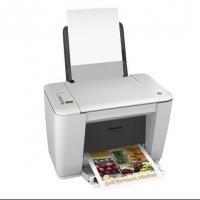 It uses standard and high yield HP Deskjet 2540 ink cartridges. The stylish HP Deskjet 2540 is a great printer for home and professional users. It makes sure of an effortless printing without hassling with your PC. The printer produces high-quality prints and uses high yield Deskjet 2540 ink cartridges that last longer and help you lower down your printing expenses. These cartridges are also available in HP DESKJET 2540 ink multipacks that last longer and offer you great savings on ink expenses. How to install cartridges in your brand new printer? HP Deskjet 2540 printer is an inkjet printer that is apt for home and office use. It produces good quality printouts. The printer comes in a compact packaging and is easy to setup. The package contains drivers, softwares and HP Deskjet 2540 ink cartridges as consumables. Though the setting up the printer is not very difficult but installing the ink cartridges for the first time requires a little guidance. The company recommends that for a better and longer maintenance of the machine and print quality, you should use the original HP Deskjet 2540 ink cartridges only. Once you have setup the printer and loaded the papers, open the cartridge access door. Make sure that while doing this the printer remains on throughout the process. When you open the cartridge access door, the cartridge carrier moves from its home position to the centre of the printer. Wait for the printer to be silent before continuing. Take the new cartridges out from the packaging. Carefully remove the orange tab. Once you do that, you will see a plastic tape. This tape has to be removed. Make sure you don not touch the ink nozzles while removing the plastic tape as it may lead to ink clogs and may eventually affect the print quality. Hold the new HP Deskjet 2540 ink cartridge by its sides. See that the nozzle is pointing towards the printer. The black cartridge has to be inserted into the slot on the right. The tricolour cartridge has to be inserted into the slot on the left. Once you have put the ink cartridges into their proper places, secure by pushing it inside till it clicks in place. After installing both the cartridges, close the cartridge access door. Wait for about 30 seconds. The alignment page will get printed automatically. This page prints automatically when the new cartridges are installed. Once the page has been printed, lift the scanner lid and place this page print side down from the right corner of the glass. Close the scanner lid and press Start Copy Black or Start Copy Color button on the printer panel. The cartridges are now aligned. Q. Is it possible for me to pay for the HP Deskjet 2540 ink cartridges by cash when the item is delivered to me? A. Unfortunately, we do not offer cash on delivery service yet. You can choose to pay by PayPal or by using a credit or debit card. We accept Laser Card, American Express, MasterCard or Visa credit card, Maestro, Switch, Solo or Delta debit card. The payment is hosted by Sage payments which secures all your details. Q. How is the print quality of HP Deskjet 2540 printers? A. HP Deskjet 2540 printers offer good quality printouts which make it useful for home and office use. They are capable of printing up to a resolution of 1200 x 1200 dpi for black and white printouts and 4800 x 1200 optimised dpi for coloured printouts. Q. Will I receive HP Deskjet 2540 ink cartridges along with the printer when buying a new printer or will I have to buy the ink cartridges separately? A. No, when you buy a HP Deskjet 2540, you will receive a pack of starter ink cartridges that are made specially for the installation of the printer. When you install ink cartridges in the printer for the first time, some amounts of ink is meant to be pushed into ink heads. You can choose to buy ink cartridges when the starter ink cartridges run out. You will find a range of HP Deskjet 2540 ink cartridges on our website. Q. Do HP Deskjet 2540 printers come with Wi-Fi support? A. Yes, HP Deskjet 2540 printers are Wi-Fi enabled. This feature allows you to print wirelessly from multiple computers and can connect to mobile devices as well. Q. I read that any damage caused due to compatible ink cartridges will not be covered by my printer. Will using compatible HP Deskjet 2540 ink cartridges with my printer make the printer warranty invalid as well? A. No, when you use compatible ink cartridges with your printer, the warranty does not become void. You are still warranted from other damages. The warranty policy does not cover damage due to compatibles, but you do not need to worry about any damage caused to your printer when using our compatible ink cartridges. Q. While installing HP DESKJET 2540 ink cartridges, what does “check ink cartridges” error message indicates? A. The “check ink cartridges” error message indicates that your HP DESKJET 2540 printer does not recognize the ink cartridges you are trying to install. Q. What might be the reasons for “check ink cartridges” error message? It may be possible that the cartridges may have the genuine electronic fault. In such cases, you need to change your ink cartridge. Q. The ink cartridges I’ve been using for my HP DESKJET 2540 printer are not much effective. I need high-quality cartridges that fit my budget too. Can I get one on this site? Q. Do you only sell single pack HP DESKJET 2540 ink cartridge? Q. I’m looking for the ink cartridges for my HP DESKJET 2540 printer and need them as soon as possible. Can you deliver them immediately? A. Yes, your order will be dispatched the same day if it is received before 12 noon. All our orders are delivered by Fastway Couriers. You can also call us on 048 30833221 if your order is urgent. Q. I have an HP DESKJET 2540 printer at work and am planning to install compatible HP DESKJET 2540 ink cartridges (HP301XL). Will their integrated printhead give the same quality prints? A. Yes, you can look forward to best quality print results with the integrated printhead too. Q. Is the ink capacity of compatible HP DESKJET 2540 ink cartridges more than that of the original ink cartridges (both individually and in the pack)? How do I know that the ink used in these cartridges is of top quality? A. Yes, as the original ink cartridges contain 8 ml of blank and 6ml of colour ink colour while the compatible version cartridges contain 15ml of both, individually as well as in a pack. These compatible cartridges are filled with ISO standard inks by the third party manufacturer, so you can be sure of its quality and end results. Q. Can I use compatible HP DESKJET 2540 ink cartridges for multi-purpose printing of images and documents? Are they also easy to install? A. Yes, these compatible HP cartridges are perfect for multi-purpose printing of images and documents. These cartridges are very easy to install as well. Q. I’ve been advised to switch over to compatible HP DESKJET 2540 ink cartridges for my HP DESKJET 2540 printer as I’ve used original ink cartridges all along. Will I be really saving more and yet experience the same quality and dependability with compatible cartridges too? A. Yes, the fact that more and more people are adopting compatible ink cartridges is proof enough of the quality and reliability of compatible ink cartridges. They are in no way substandard than the original cartridges and you’ll actually be saving a whopping 49% with these compatible cartridges (as you’ll be using just about just half of the ink) in and also find it perfect for printing top quality text and images. Q. Is it possible to scan from the HP Deskjet 2540? A.Yes, this printer is named the 'All in One' Series. This means that it is capable of printing, scanning, and photocopying from home. A. Yes, this printer is perfect for all uses in the home including colour printing photographs. However, we would advise that the genuine cartridges be bought for this use, as the quality will be slightly better than with a compatible cartridge. Q. Do you sell this printer please. A.Unfortunately we do not sell nor stock this printer. Q. What is average printing speed of HP DESKJET 2540 printer? A. HP DESKJET 2540 provides you an ideal speed of 20 ppm for black and white prints and 16 ppm for coloured prints. The provided printing speed lets you print your jobs more efficiently. Q. Can I take out photocopies using HP DESKJET 2540 printer? A. Yes, you can take out photocopies from the printer as the printer comes along with additional benefits of Photocopier and Scanner. Q. What does 2 Pack Remanufactured HP301XL (HP DESKJET 2540 ink cartridges) contains and what are the ink volume capacities of these cartridges? A. The pack contains two cartridges one black and one coloured cartridge with capacities of 15ml each. Q. What is the advantage of using remanufactured HP DESKJET 2540 ink cartridges over the original ones.? A. There are two benefits of using remanufactured cartridges instead of original ones. The first is the cost which is very less in comparison to original ones and another one is the quantity that is greater (almost double) than that of the original ones. Q. What are acceptable paper sizes that the printer HP DESKJET 2540 accepts and what resolution does the printer offers? A. HP DESKJET 2540 accepts A4, legal, envelop and letter sizes. The printer aims to give a resolution of 600*300 dpi for both black and white as well as coloured prints. Q. How the Remanufactured HP DESKJET 2540 ink cartridges differs from the original HP cartridges? A. The remanufactured cartridges are previously used HP cartridges only that are further collected and are sent to the factory for cleaning and restoring of inks. Also, the ink filled in the cartridges are ISO standard inks that not only ensures the print quality but also ensures that it is remanufactured by eco-friendly means. Q. I have a Remanufactured HP DESKJET 2540 printer. I tried installing cartridges to it but why is it still giving me error message “Check Ink Cartridges”? The ink cartridges are empty. The cartridges are not properly positioned. The ink cartridges are not recognizable by the printer. At first sometimes these cartridges require some simple troubleshooting steps, for these troubleshooting steps you can contact us by telephone on 048 30833221 or email us on info@printerinkcartridges.ie. However, to overcome any of this scenario by yourself, you either need to refill the cartridges or reposition the cartridges. Still, if the printer doesn’t recognize the cartridges, make sure they are compatible with the printer. Q. Which colour does the 3 Pack of Remanufactured HP DESKJET 2540 ink cartridges contains? A. This pack of cartridges contains two black coloured ink cartridges and one tri-colour ink cartridge. The colours offered are Magenta, Cyan and Yellow. Q. What is the expected print volume of Remanufactured HP DESKJET 2540 ink cartridges? A. CH563EE (HP301XL) and CC564EE (HP 301XL) gives you an approximate print volume of 480 and 330 pages respectively and provides you great print results. Q. Does HP DESKJET 2540 supports phone connectivity? A. Yes, you can connect the HP DESKJET 2540 printer with any of your smartphone, tablet or pc. Being a wireless printer, it provides you an ease of connectivity from your devices and makes the job easier. All you need to do is to install an All-in-one HP printer mobile app from where you can scan and print the documents. Q. If I order the Remanufactured HP DESKJET 2540 ink cartridges, how long does it take for the order to get delivered? A. If you order the above-mentioned cartridges before 12 noon, your order will be dispatched on the same day for the next day delivery. And the orders after 12 noon will be delivered on second business day.